This morning I decided to prepare a list with the best traditional roguelike RPGs with turn-based mechanics. I will listen to the community suggestions to update the list often. Before starting, however, let’s see what we mean by roguelike. Over the years, the term roguelike has changed a bit, also indicating action and platform games like Spelunky, Roguelike Legacy, The Binding of Isaac etc. as long as they had procedurally generated elements and perhaps the permanent death of the hero. But in my list, I returned to the traditional meaning of the word roguelike and chose the games that took all the pure elements of this genre. Roguelike is a term that indicates a particular type of role-playing video games, characterized by common elements: random maps, permanent death, and turn-based movements. The name of the genre refers to Rogue, a 1980 video game based on the role-playing game Dungeons & Dragons. Originally the titles of this genre were characterized by a simple interface created by ASCII characters, but recently many titles, have managed to apply the same dynamics without sacrificing the graphic appearance. Typically the roguelike are in a fantasy setting, and the player plays a character intent on exploring dungeons, killing monsters, collecting various objects and interacting with the environment, nevertheless many developers have managed to transpose the same style of play even in science-fiction settings. ..and many objects that can be created, equipped and used. 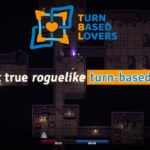 Roguelike originally developed by the German Thomas Biskup in 1994, revisited in 2012, is the touchstone of the genre and a classic in the world of video games with more than twenty years of development and optimization behind. ADOM is an epic fantasy Roguelike. The story takes you to the Drakalor Chain, a mountainous area in the fictional land of Ancardia. You are a lone wanderer whose purpose is to find the source of the Chaos spreading throughout the land. Pursuing your quest you traverse through dark dungeons and untamed wilds where death lurks around every corner. An unforgiving 1994 roguelike game at its core, ADOM is brought to a new audience with hand-crafted graphics, beautiful music, and a modernized UI. You can find ADOM on Steam. Rogue Empire is an indie tactical turn-based RPG developed by Portal Entertainment where we will guide a completely customizable hero for class and skill. Rogue Empire is already available in the Early Access version for PC. At this link, you will find the steam page. Developed by Kerberos Productions Inc., The Pit is a turn-based RPG that will keep you glued for hours in front of the screen, and every time you die (and this often happens) you will want to start a new game. The Pit is set in the universe of Sword of the Stars, in fact, you will find references and creatures of the famous game. Another interesting and fun roguelike turn-based RPG developed by Gaslamp Games, Inc. where we will have to explore procedurally generated dungeons. The game also features a deep crafting system. You can get Dungeons of Dreadmore on Steam. One of the most well-kept and deep roguelike dungeon crawling RPG with turn-based mechanics by indie Impact Gameworks. After a successful Kickstarter in March 2017, Tangledeep was Greenlit by the Steam community and released to 90% + positive reviews in February 2018. Steam Workshop: Create and download player mods with new monsters, items, sprite sheets, areas, and more! You can get Tangledeep through Steam. With very positive reviews and over 80 hours of gameplay, Dungeons of Chaos by Volker Elzner is a tribute to the 2D turn-based pixelart RPGs of the 80s. You can get Dungeons of Chaos through Steam. Golden Krone Hotel is a gothic horror very tough roguelike developed by Vulgat. Fight vampires with sunlight or become a vampire yourself and sneak in the shadows. Vampires can see in darkness and drink blood to regenerate, but they’re extremely vulnerable to sunlight and water. Humans can cast magic and wield weapons, but they’re frail compared to vampires. Get Golden Krone Hotel on steam. Tales of Maj’Eyal is a turn-based roguelike RPG developed by Netcore Games, featuring tactical turn-based combat and advanced character building. It presents a modern graphics but remains faithful to the mechanics of the original roguelikes. Turn-based: think before you act! You can get Tales of Maj’Eyal on Steam. Developed by Adventurepro Games LLC, Dungeonmans is available on Steam. Is a promising turn-based RPG with roguelike mechanics that I have been following for a long time. Here you will find my overview of the game. We will dress as a hero who will also lead a caravan that as we go along in our adventure, grow and find new helpers. We’ll have to explore dungeons, fight monsters, and be careful not to die..permanently. Developed by Ink Stains Games. You can wishlisting StoneShard on steam. Its released will be in Q1 2019 for Pc. Here you will find the Steam page of the game. As mentioned at the beginning of the article, I will try to keep this list updated by listening to your suggestions, so if you want to suggest a traditional roguelike RPG do not hesitate to do it through comments below or by contacting me on Twitter. In the meantime, take a look at the other lists I have prepared to discover some interesting turn-based games.